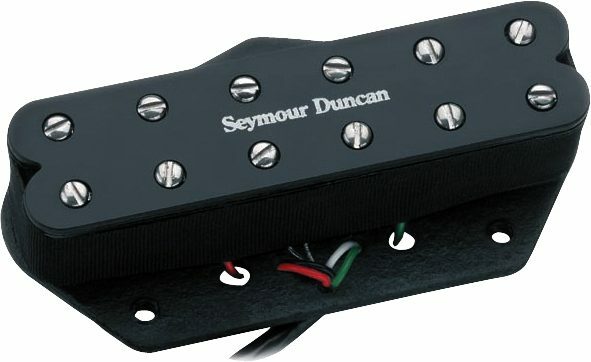 This lead pickup is a hybrid. Designed for the Telecaster player who wants to rock, this little beast delivers a warm, smooth tone, reminiscent of an old '59 Patent Applied For humbucker mixed together with a healthy dose of beefed up twang. Comes in black only with four-conductor cable. Complete setup: Available in lead (bridge) position only. Matches up well with a Vintage Rhythm Stack for a totally quiet rig; or with a Hot Rhythm for an all-around hot axe. 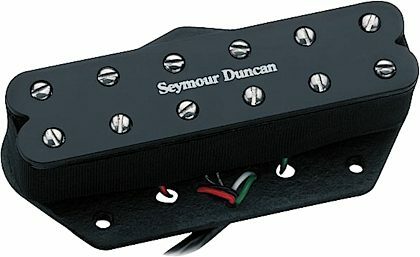 "Seymour Duncan 'lil 59 Telecaster Bridge Pickup"
Overall: A most excellent pickup, with the humbucker sound I was looking for. Great clarity and punch. Exact fit replacement with no modifications needed whatsoever. It was as described and delivered in a most timely fashion. This was paired with an existing single coil Wilde Deluxe Keystone in the neck and matched perfectly. I am very happy all the way around. "Seymour Duncan ST591 Little 59 Tele"
Overall: The S.D.ST591 is a very versityle pickup you can play in any style. It doesn't only have the Tele sound bet, it gives you all kind of sounds. From Metal to Blues, Funk,Soul R&B,Etc. Excellent pickup and if is a Seymour Duncan you can't go wrong.I put it on one of my Fender Strats with a five way switch, Holy Smoke's Batman the Church's on fire!!!! It totally rocks with all the different sound I got at my disposal. Great pickup.